Written & Produced by Ron Zakrin. Recorded at the Beehive, Detroit. 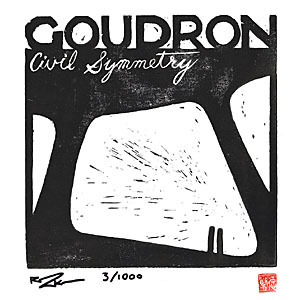 Goudron is back with his second 12" on Ersatz Audio entitled "Civil Symmetry" featuring 5 new songs presented in a one-of-a-kind jacket. 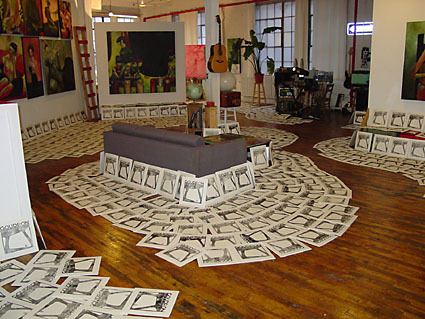 The jackets for "Civil Symmetry" were created by hand using the laborious technique of block printing, then hand numbered and signed by the artist. Owning this stunning record is also owning an original work of art, limited to only 1,000 copies. 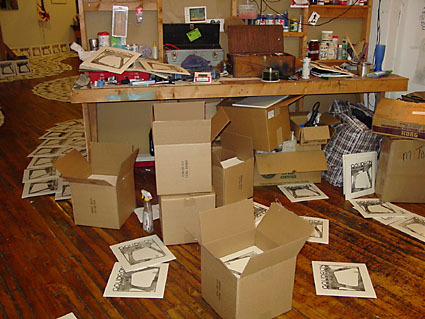 Goudron is Detroit musician and artist Ron Zakrin. "Civil Symmetry" is classic Ersatz Audio, filled with incessant drum machines, rich analog synthesizers and arresting structures. This EP is rich in perpetual tonality shifts with a thick atmosphere of unwavering purpose. Side A starts with the unfailing drive of "Civil Symmetry" and "Rumble Queen", ending with the playfully catchy "All The Chaps". Side B continues the assertive thrust of Side A with "Yellow #5" and concludes the record with the horror ballad "Run" - a personal favorite of the label. Symphonic strings, complex rhythms, impenetrable layers and effortlessly delivered melodies come together to create the unforgettable sound of Goudron. "Civil Symmetry" is honest, hard-working and authentic electronic music. 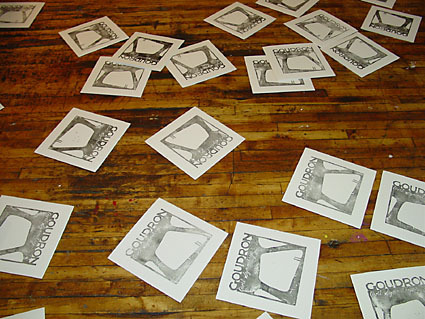 With sincerity waning in contemporary music, Goudron is a breath of fresh air. Anticipate restitution. Also, be sure to keep an eye out for Goudron's upcoming full length CD entitled "Raw Voltage" coming out on Ersatz Audio May 18th. 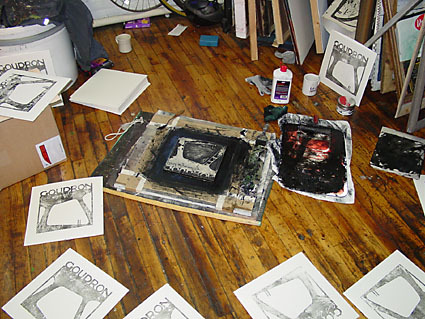 BELOW ARE PHOTOS OF THE BLOCK PRINTING PROCESS AND HOW IT DISTURBTED THE DAILY ROUTINE OF RON ZAKRIN. 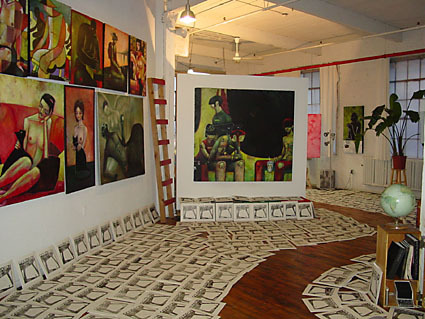 A NICE SELECTION OF MR. ZAKRIN'S PAINTINGS CAN ALSO BEEN SEEN ON HIS STUDIO WALLS, CHECK 'EM OUT.